This time, Virbhadra Singh had to fight a tough battle of his political career, spanning over five decades, to be elected as leader of the Congress Legislature Party, but it was a smooth affair compared to those in 1993 and 2003. State Congress chief Virbhadra Singh meets supporters at his residence Holly Lodge in Shimla on Sunday. Chief Minister designate Virbhadra Singh today said the revival of the state Administrative Tribunal, review of the decision to close down schools and the repair of roads would be the top priorities of the new Congress government, besides expeditious probe into land deals and charges of corruption. Despite having to face odds of finding roots on a new turf due to the delimitation exercise, a majority of those affected by it have not only emerged triumphant, but also come out with flying colours. The assets of 47 newly elected legislators grew by a staggering 184 per cent, on the average, in the last five years, according to the National Election Watch (NEW), a non-government organisation that monitors elections in the country. The Himachal Pradesh Congress Committee (HPCC) today expressed its gratitude to All-India Congress Committee chief Sonia Gandhi for honouring the sentiments of people of the state and elected members of the Assembly by naming Virbhadra Singh as the Chief Minister. Janki Dass Dogra, senior vice-president, District Congress Committee (DCC), Mandi, has congratulated Virbhadra Singh who is going to be inducted Chief Minister of Himachal Pradesh for the sixth time. The snow-capped Solang ski slopes are dotted with paragliders these days. Christmas trees can be seen and persons dressed as Santa Claus roam the Mall to attract Christmas and New Year Eve revellers. Tourists have been zeroing in on the town to enjoy in the snow. They have been making a beeline for the ski slopes. Christmas and New Year Eve revellers at the ski resort in Solang. The Archaeological Survey of India (ASI) has said under the provisions of the Ancient Monuments and Archaeological Sites and Remains (AMASR) Act, 1958, repairs and renovations were permitted within the prohibited area, ie, 100 m from the monument. Three more sections have been added in the FIR lodged against Doon legislator Ram Kumar Chaudhary, who is facing the charge of murder. These pertain to the use of mobile phone SIM cards procured on the basis of forged documents. These sections have been added to Section 302 of the Indian Penal Code (IPC), which concerns murder, and the relevant section under the SC/ST Act. The Aam Aadmi Party (AAP) has said it will create a corruption-free society where the common man can lead a respectful existence with ample access to employment, health and education. 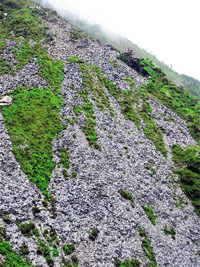 The illegal mining in the mountains along Khaniara village is continuing despite ban orders of the Himachal High Court. When The Tribune team visited the area, slates mined illegally from mountains were being brought openly to the market of Khaniara village. Trucks of slates were being loaded and sent out. 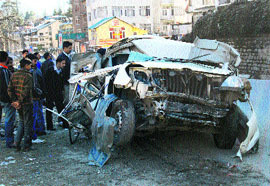 Six persons were injured in three different road accidents in Kangra district during the last 24 hours, the police said here today. Three persons, including the driver, were killed after an Innova car collided with a tree at Rangri, 3 km from here, on last night. According to the police, three youths were found dead at the spot. The Innova (HP01K-2464) in which they were travelling was on its way to Kullu from Manali. The speeding car collided with a poplar tree and was damaged so badly that the police and fire services had to cut open the chassis of the car to extract the bodies. The police arrested a man and recovered 1.150 kg charas from him near the Bhatalwan Mod on the Chamba-Jot road this morning, according to an official report received here today. Maziz Deen of Malot village was yesterday produced in a local court by the police for allegedly setting on fire his sister-in-law (wife of his diseased younger brother). The court sent him to three-day police remand. Maziz was arrested by the police on Friday evening. The Jawali police today arrested Baldev Mankotia, father-in-law, Manorama, mother-in-law and Shashi Pal, brother-in-law of complainant Anuradha Devi (26) of Darkati village under Jawali police station in a dowry harassment case. The Himachal Pradesh High Court (HC) has stayed the decision of the Himachal Pradesh Private Education Institutions Regulatory Commission to pay 1 per cent of the total fee collected to establish a fund by the commission. Girls should take their studies very seriously and prepare themselves for future challenges of life. This call was given by Deputy Director of Education Bir Singh Negi while addressing an annual prize distribution function of Government Shaheed Vijay Pal Memorial Girls Senior Secondary School, Ghumarwin, near here, yesterday. Additional Sessions Judge (Fast Track Court), Chamba, Mukesh Bansal has sentenced Suli Ram of Kandwas village, Churah tehsil, Chamba district, to undergo rigorous imprisonment (RI) for life and pay a fine of Rs 20,000 for murdering Harish of the same village. In default of the payment of fine, he would further undergo RI for a period of six months. A man-eating leopard, which has killed one child and injured a number of people in Bhapral and Marhana in Ghumarwin, was seen at Thandoda village near Lanjhata on Friday. The authorities concerned have already issued orders to shoot the feline dead. It did not require any pressure tactics to get the nod of the party high command. On the previous two occasions, he had paraded newly elected legislators before the media to demonstrate that he had the support of the majority. This time, the high command had tread cautiously and did not make any move which could undermine his position and send the wrong message to the rank and file of the party and the electorate which reposed confidence in his leadership. With the tussle over leadership over, focus has shifted to the formation of the ministry, which will not be as tedious as it had been in the past for a number of reasons. The Congress has a thin majority, with just 36 legislators. Senior leaders Gangu Ram Musafir, Ram Lal Thakur, Rangila Ram Rao and Vijay Singh Mankotia, who could not be left out, lost the elections. Outgoing Chief Minister PK Dhumal started the practice of appointing Chief Parliamentary Secretaries (CPSs), which the Bharatiya Janata Party had been opposing while in the opposition. Virbhadra Singh has indicated that he has in mind a three-tier ministry, which means that there will be Cabinet ministers, ministers of state and CPSs. 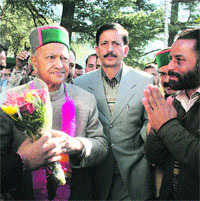 In 2003, 15 Cabinet ministers were administered the oath along with Virbhadra Singh due to factional pressure. There were problems later when the number of ministers in small states was capped at 12. Virbhadra Singh was forced to drop Mankotia, Chandresh Kumari and Brij Bihari Lal Butail, all from Kangra district, which later led to bickering in the party. With 12 ministers, the Speaker, the Deputy Speaker and three or four CPSs, almost all claimants can be accommodated this time. Kangra district, from where the party has won 10 of the 15 seats, will get the lion’s share. Those in line are GS Bali, Sujan Singh Pathania, Butail and Sudhir Sharma. Caste considerations can bring in Neeraj Bharati, who is from the Other Backward Classes. Besides Asha Kumari, Thakur Singh Bharmouri, who represents a tribal seat, is also a strong contender in Chamba district. In Una district, Mukesh Agnihotri is the frontrunner and former minister Kuldeep Kumar the other contender. In all probability, Vidya Stokes from Shimla district will be the number two in the ministry. From Mandi district, Kaul Singh Thakur and Anil Sharma are sure to find a place in the ministry. Dhani Ram Shandil from Solan district, Rajesh Dharmani from Bilaspur district, Karan Singh from Kullu district and Jagat Singh Negi from Kinnaur district are the other claimants. Talking to mediapersons before leaving for Delhi, he said he would wage a war against corruption and make the government machinery functional to improve governance and help restore the confidence of people in the government. All the permissions granted under Section 118, Land Reforms and Tenancy Act, would come under the Vigilance scanner and the cases of Bamloe Builders and sale of Bantony would also be under focus. Heads would roll if any wrongdoings came to light, but he asserted that cases would be pursued only if there was sufficient evidence which could stand judicial scrutiny and his government would not indulge in political vendetta. Special Investigation Teams would be set up to investigate major corruption cases, including the Benami land deals. All the allegations figuring in the Congress charge sheet submitted to the President of India would be investigated, but there would be no “witch hunting”. The Dhumal regime had closed down about 700 primary schools and also scrapped the state Administrative Tribunal to deny a forum to employees for seeking justice. Both these decisions would be reviewed. Referring to the constitution of the ministry, he said all sections of the society would be included in the ministry which would have Cabinet ministers, Ministers of State and Chief Parliamentary Secretaries. About the choice of the Speaker of the Assembly, he said he had three persons in mind, but would not divulge the names at this stage. Apprehension of being able to find ground on a new territory actually turned out to be unfounded as almost all leaders, both in the Congress and the BJP won from the new seats they shifted to. Leading this group of displaced leaders was former Health Minister and now state BJP general secretary Rajeev Bindal. He is the lone leader in the state who not only shifted his constituency, but also hopped from Solan to Sirmaur district to find a seat for himself. Bindal, despite having remained the most controversial minister in the Dhumal regime, managed to turn the tide in his favour. He won from the Nahan constituency with an impressive margin of 12,824 votes. With his seat of Solan being reserved, he scouted for a constituency well in time and found acceptability in a new district with ease. The other leader, who proved his mettle despite facing stiff opposition from the entire Shanta Kumar camp, was Ravinder Singh Ravi. A close confidant of Chief Minister PK Dhumal, his constituency of Thural in Kangra district was scrapped. He was keen to contest from Jwalamukhi that now has major parts of Thural but owing to Shanta’s opposition, he could not move there. A reluctant Ravi then took the plunge from Dehra and emerged victorious with an impressive margin of 15,293 votes. On the contrary, Food and Civil Supplies Minister Ramesh Dhawala, who did not make way for Ravi in Jwalamukhi by agreeing to shift to Dehra, lost the elections. Similarly, Sudhir Sharma whose seat of Baijnath was reserved had to finally settle down in Dharamsala. Though he was keen to shift from Baijnath to the adjoining segment of Palampur, with that being possible he contested from Dharamsala. Though Sudhir benefitted from the presence of a rebel BJP candidate in Kamla Patyal, with the local Congress leadership opposing him he had a tough time. He finally silenced his opponents by winning with a comfortable margin of 5,000 votes. Two other leaders from the Congress - Kuldeep Kumar, former minister, and Rakesh Kalia too were impacted by delimitation. The two swapped their seats as Kalia’s constituency of Chintpurni got reserved, which suited Kumar. So Kalia shifted to Gagret that had been thrown open and Kumar moved to the newly reserved seat of Chintpurni. Though some other leaders like Chief Minister PK Dhumal, state Congress chief Virbhadra Singh and Congress Legislature Party leader Vidya Stokes too were partially affected by delimitation, they faced no issue in winning, considering their stature. Dhumal shifted to Hamirpur from his old seat of Bamsan that was merged into other segments. Virbhadra’s seat of Rohru too was reserved and he shifted to Shimla (Rural). Stokes too shifted to Theog from Kumarsain, which too was merged into other segments. None of the national parties like the Samajwadi Party (SP), the Bahujan Samajwadi Party (BSP), the CPM and the CPI, nor the latest outfit floated by BJP dissidents, Himachal Lokhit Party (HLP), could touch the one lakh figure in terms of votes they polled in the Assembly elections this time. Among the 15 political parties who had put up candidates, none except the Congress and the BJP crossed the one lakh mark. The performance of the HLP can at best be termed decent as its 36 candidates polled 81,024 votes with the poll percentage touching 2.39 per cent. Barring the Congress and the BJP, it is only the 106 Independents who managed to put up a good show by polling 4.10 lakh as compared to 2.62 lakh in the 2007 poll. In fact, six of them, as compared to three in the previous poll, won. 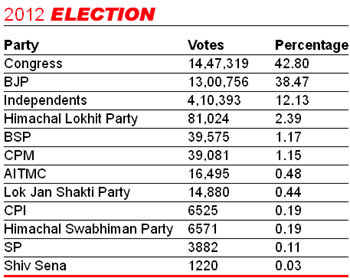 A total of 33,81,023 votes were polled this time as compared to 32,91,666 votes. The vote share of the BSP showed a tremendous decline from 2.38 lakh in 2007 to 39,575 this time with a mere 1.17 per cent. With former minister Vijai Singh Mankotia as its state convener, the BSP had not only won the seat of Kangra as Sanjay Choudhary emerged victorious, but its candidates also performed well in districts like Kangra, Una, Hamirpur and Bilaspur. The CPM also enhanced its vote share marginally as compared to 18,916 votes polled last time its candidates polled 39,081 votes at 1.15 per cent. The share of the CPI remained almost static as compared to 6,366 votes it polled in 2007, this time it touched 6,525 votes. Notwithstanding the loud shrill created by the All-India Trinamool Congress in its campaigning in the hill state, its party candidates got merely 16,495 votes in its favour at a mere 0.48 per cent. The votes polled by the Congress went up from 12.80 lakh in 2007 to 14.47 lakh this time, thereby giving a gain of 13 Assembly seats. The Congress had a total of 23 seats in the last assembly while this time it will have 36 legislators. The BJP’s votebank dipped from 14.41 lakh to 13 lakh this time, thereby denying it the chance to create history by returning to power. As such the number of BJP legislators too has gone down from 41 in 2007 to 26 this time. Rajiv Sazal, the Bharatiya Janata Party (BJP) legislator from Kasauli, leads the pack, says NEW. His assets have grown by 1,936 per cent, from Rs 1.53 lakh in 2007 to Rs 29.52 lakh in 2012, says NEW member Bhim Singh, citing affidavits submitted by candidates. The assets of Anil Sharma, the Congress legislator from Mandi, who is the richest, have increased from Rs 3.11 crore in 2007 to Rs 29.70 crore in 2012, says NEW. The assets of GS Bali, the Congress legislator from Nagrota Bagwan, who is the second richest, have increased from Rs 3.81 crore in 2007 to Rs 24.85 crore in 2012. The assets of Brij Bihari Lal Butail, the Congress legislator from Palampur, have increased from Rs 91.92 crore in 2007 to Rs 169. 21 crore in 2012. He had lost in 2007. Virbhadra Singh has shown an increase from Rs 24.18 crore in 2007 to Rs 33.65 crore in 2012. His assets grew by 39 per cent. Outgoing Chief Minister PK Dhumal has shown an increase of 119 per cent. KD Dharmani, the BJP legislator from Jhandutta, has an increase of 874 per cent. Vidya Stokes, the Congress legislator from Theog, has shown a growth of 724 per cent. Ajay Mahajan, the Congress legislator from Nurpur, has shown an increase of 624 per cent. Sudhir Sharma, the Congress legislator from Dharamsala, has shown a growth of 484 per cent. Gobind Thakur, the BJP legislator from Manali, has shown an increase of 444 per cent. The assets of outgoing BJP ministers Sarveen Chaudhary (Shahpur), Ravinder Singh Ravi (Thural), Jai Ram Thakur (Seraj), Rajiv Bindal (Nahan) and Gulab Singh Thakur (Jogindernagar), all re-elected, have increased by 426 per cent, 404 per cent, 334 per cent, 301 per cent and 178 per cent, respectively. The average assets of newly elected BJP legislators, also elected in 2007, have increased by 181 per cent and all of them are ‘crorapatis’. The average assets of 12 Congress legislators, all re-elected, have gone up by 184 per cent. The average assets of 24 Congress legislators have increased by 107 per cent from 2007 to 2012. The average assets of 22 BJP legislators have showed an increase of 183 per cent in the same period, NEW observes. The average assets of legislators contesting again in 2012 is Rs 5.04 crore. It is an increase of 184 per cent and a growth by Rs 3.26 crore. The average assets of legislators fielded by the parties in 2007 was Rs 1.77 crore. Stating this here today, spokesman of the committee Kewal Singh Pathania said Virbhadra Singh, a mass-based leader who was assigned the job by Sonia Gandhi to bring the Congress party back to power in the hill state, had accomplished the mission by carrying out a campaign for just 35 days in the state. He said had Virbhadra got ample time to carry out the campaign, the Congress would have got two-third majority in the Assembly. Pathania said the Virbhadra government would sort out the much-vexed Kangra Central University issue and this set up the varsity at Dharamsala or a nearby area. He thanked the electorate of Kangra district who had supported the Congress by electing 10 out of 15 candidates because of developmental projects set up here during the previous Virbhadra government which included the DRPGMC at Tanda and the state Assembly complex at Tapovan, besides other big projects. 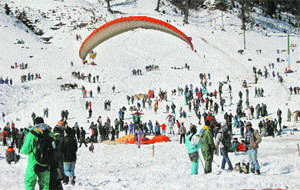 The snow-capped Solang ski slopes are dotted with paragliders these days. Christmas trees can be seen and persons dressed as Santa Claus roam the Mall to attract Christmas and New Year Eve revellers. Tourists have been zeroing in on the town to enjoy in the snow. They have been making a beeline for the ski slopes. The ski resort in Solang also offers joyrides in cable cars on snow. Revellers have given a boost to the sagging hotel industry. Occupancy in Manali, Shimla and Dalhousie, besides other hill stations, is up from between 10 per cent and 20 per cent in November to around 60 per cent these days, say travel agents and hoteliers. State-run Himachal Pradesh Tourism Development Corporation (HPTDC) hotels in the Manali, Shimla and Dharamsala tourist circuits have been running to packed houses. Cashing in on the boom, the HPTDC has done away with its special economy package of Rs 10,000 from December 24 to 31 for those on honeymoon, launched five days ago. HPTDC has offered a honeymoon package of three-night-and-four-day stay in its hotels in Manali, Shimla and Dharamsala circuits, says HPTDC General Manager Yogesh Behl. Including food and travel in Volvo buses from New Delhi, it will be continued till March 31, barring the period from December 24 to 31, he adds. The state government has failed to restore air connectivity to Kullu, Shimla and Kangra airports, affecting the arrival of high-end tourists, rue hoteliers. Manali Hoteliers Association president AR Thakur says tourist arrival has increased and this is the case around Christmas and New Year Eve. Air connectivity and good condition of roads can help rev up winter tourism, he adds. Hotels have been offering song and dance evenings with disco jockeys to attract guests. The HPTDC will select ‘Winter Queen’ in Manali on New Year Eve. Kullu Deputy Commissioner Amandeep Garg says a winter carnival will be organised in January next. The other construction-related activities such as renovation, reconstruction and repairs are also permitted in the regulated area, ie, 200 m from the monument, after obtaining permission from the competent authority, it added. The ASI Director (Monuments) said it appeared that the AMASR Act was not understood rightly and there was no bar on addition, alteration, renovation or construction within 300-m area from the protected monument. The ASI officials said this in reply to Chamba Welfare Association president RK Mahajan’s letter to the President of India wherein he had raised apprehensions regarding the misinterpretation of the said Act. All routes to Himachal Pradesh have been sealed by the Panchkula police and the Himachal Pradesh Police so that Chaudhary is not able to escape. The SIM card dealer arrested in the Jyoti murder case, 23-year-old Ashish, was today produced in court, which sent him to police remand for one day. “We have added Sections 467 (forgery of valuable security), 471 (forgery for the purpose of cheating) and 472 (making or possessing counterfeit seal etcetera with the intent to commit forgery) of the IPC in the FIR for using SIM cards procured on forged documents against Chaudhary and his accomplices,” said Assistant Commissioner of Police Virender Sangwan. On Friday, the Panchkula police issued arrest warrants against Chaudhary, his friend Paramjeet and his nephews Dharampal and Gurmeet. On Thursday, Chaudhary was declared elected from the Doon constituency in Himachal Pradesh on the Congress ticket. The same day, he claimed before the media that he was innocent, saying he had joined the investigation and had cooperated fully with the police. Jyoti’s father Buti Ram had alleged a threat to his life, claiming he was offered Rs 50 lakh near a Hoshiarpur village to settle the case and was threatened that he would be killed on his refusal to accept it. Vishal Sharma, national observer of AAP for Himachal Pradesh, said this while talking to mediapersons after inaugurating the party’s district office at the main market here on Friday. Sharma said he was setting up 10-member executive committees of the party in all districts of the state with five women members each. This would be completed by January 5 in all 337 districts of the country, he said. He informed that these members would meet in Delhi on January 26 to finalise the next course of action of the party. He said retired Judge OP Sharma had been appointed the district Lokayukta for Una and each district would soon have such Lokayuktas who would look into any complaint against the party members. He said the district unit in Una had been set up and such units would be set up in Mandi and Chamba on December 23 and 25, respectively. Sources said traders were engaging poor locals for carrying out mining. The locals reached the slate mines located in mountains in the early morning hours. The slates were mined and brought downhill on mules or donkeys. The High Court had banned mining in the area in 2000 on a PIL raising environment concerns. The Centre of Science and Environment (CSE), a Delhi-based NGO, in a report released recently had also mentioned the illegal mining in the area as a major environment concern. Despite the fact that all operations of illegal mining and sale of slates are continuing openly, Mining Department officials have turned a blind eye towards the entire activity. The sources said the mining officials were not acting in the matter due local political pressure. Industry Minister Kishan Kapoor, in the outgoing government, who also controlled the Mining Department, was also a resident of Khaniara village. District mining officials expressed surprise that illegal mining was taking place in Khaniara. They assured the team to check up the matter. Though as per a High Court order, mining is banned and carrying out this activity amounts of contempt of court orders, mining officials legalised illegal mining by imposing fine on confiscated material and allowing it to move into the open market. After mining was banned in the Khaniara area, the Himachal Government got permission from a special empowered committee of the Supreme Court to allow mining in 25-hectare area. The Himachal Government about seven years ago deposited Rs 11 lakh with the Forest Department to get the land for mining leased out of a time period of 30 years. However, the sources said the mining potential of the leased out 25 hectares had already been exploited. Most of the mines in the leased out area had already closed. However, in lieu of the leased out 25 hectare area, illegal mining was continuing in the hills adjoining Khaniara village. This was seriously damaging the ecology and green cover of the hills. Villagers alleged that even the Forest Department was turning a blind eye to the illegal mining even when it was taking place in their land and damaging trees. The villagers demanded that a permanent police post should be set up at Khaniara village to check illegal mining. Kangra District Police chief DS Thakur said here Jasour Jagdish Chand riding a scooter (HP-40-5690) was injured when he fell down from his vehicle near Kholi bridge on the Pathankot-Mandi National Highway on the outskirts of this town and was admitted to DRPGMC, Tanda, today. He said Surinder Singh of Pandrer driving Scooty (HP-38 B-6152) was injured when Raj Kumar of Samela riding motorcycle (HP-38-9867) hit his vehicle at Khajan today and both were injured and admitted to the hospital. 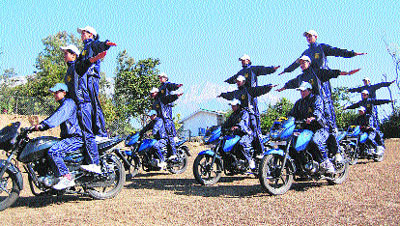 The SSP said Sachin Kumar riding a motorcycle (HP-56-1474) hit an unidentified boy at Jhunga Devi today and as a result three persons were left injured. He said the motorcycle rider and the boy were referred to DRPGMC, Tanda, and another injured to Sujanpur hospital. Cases were registered under Sections 279 and 337, IPC, at different police stations today. Three persons, including the driver, were killed after an Innova car collided with a tree at Rangri, 3 km from here, on last night. According to the police, three youths were found dead at the spot. The Innova (HP01K-2464) in which they were travelling was on its way to Kullu from Manali. The speeding car collided with a poplar tree and was damaged so badly that the police and fire services had to cut open the chassis of the car to extract the bodies. The deceased have been identified as Balwant Kumar (27) of Dharmshala, Vijay Kumar (27) of Palampur and Ravi Kumar (30) of Palampur. Manali Deputy Superintendent of Police Sanjeev Chauhan said after a postmortem examination, the bodies had been handed over to family members. The report said the man had been identified as Tej Ram of Parnoti village falling in Churah sub-division of the district. The accused had tried to run away on seeing the police, which was on its naka on the Chamba-Jot road. A case had been registered under Section 20, Narcotic Drugs and Psychotropic Substance (NDPS) Act, at Chamba police station and further investigation was underway. The police said he sprinkled kerosene on victim Maskina Bibi (31), while she was sleeping in her room with her children on Thursday night. After hearing her cries, neighbours came to her rescue and doused the fire. She was rushed to the Community Health Centre in Indora from where she was referred to the Civil Hospital, Nurpur. Later, she was admitted to a private hospital in Pathankot with 30 per cent burn injuries. The victim’s father Rirak Deen of Metta village lodged a complaint against the accused yesterday for trying to kill his daughter. In his complaint, Rirak said his daughter had got married to Habib Deen of Malot village who died six years ago. He alleged that the accused had usually been quarrelling with his daughter. Deputy Superintendent of Police (DSP) Rajinder Jaswal said a case under Sections 307 and 452, IPC, had been registered against the accused and he would be produced in the court on January 24. 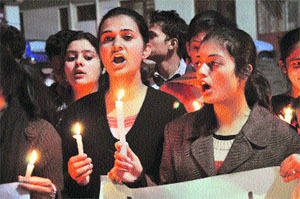 The victim was not in position to give her statement to the police so far, the DSP said. DSP, Jawali, Sanjay Sharma said a case under Sections 498-A, 323 and 34, IPC, against five members of her in-laws, including husband Kulbhushan, was registered three days back. He said the complainant had married Kulbhushan of Maskar (Lahru) in 2009 and all accused had been harassing, torturing and beating her demanding more dowry. The husband and sister-in-law of the complainant were still at large, he added. In an order passed by a two-member HC Bench hearing a petition filed by the Himachal Pradesh Private Universities Management Association, the court stayed the operation of the notification of the commission. The HC stayed the notification of the commission to receive all sums accrued by private educational institutions and those collected by way of penalty, except those prescribed under the Himachal Pradesh Educational Institutions (Regulatory Commission) Rules 2011. The HC ordered the commission to keep all sums received by way of penalty under a separate account. He said hard work was the only magic key to success in life and those of them who would make hard work their habit, would certainly achieve whatever their ambition was. Negi exhorted teachers and parents to oversee the progress of their wards and help them go ahead in studies and other activities of their liking. He said it was a team work and they had to collaborate with the students to ensure a brilliant career for them. The chief guest also distributed prizes and certificates to students who had excelled in academic and extra-curricular activities. He gave a special prize to Anupam who had stood first in X plus II in the state in annual examination. Iti Gauttam was declared the best student and Sarojini Naidu House the best house. Puja Kumari was declared best NSS volunteer and Kavita Kumari best NCC cadet. RP Chopra, Principal, Government Post-Graduate College, Bilaspur, gave stipends worth Rs 1,000 each to 10 poor girl students. School Management Committee president Banke Bihari also presented Rs 1,000 to Nidhi. Earlier, Principal Neelam Sharma read the school progress report. Present on occasion were retired Deputy Director of Education Ram Lata Sharma, Principal, Government Boys Senior Secondary School, Ravi Kant Sharma, Block Education Officer Prem Singh and prominent citizens Sanjivani Devi, Brij Lal Sharma, Lal Singh Patial and Shakuntala Devi among others. According to the judgment here on Saturday, complainant Bhagat Ram had stated that on December 18 last year he had sent his son Harish to bring nails from a shop at Sagluga village. When he did not return, he went in search of him. He found his son’s body in the fields near Fuldwas village. Harish was lying with his face upwards and a heavy stone weighing about 20 kg had been kept on his belly. His face was smeared with blood. He also had head injuries. After a few days, Bhagat came to know that Suli Ram had murdered his son. Reports said the leopard was hiding behind bushes near a school where children were playing. Some Himalayan dogs of nomad Gaddis spotted it and villagers gathered at the spot and the wild cat fled. Divisional Forest Officer DR Kaushal, accompanied by other officials, also rushed to the spot with staff, but the leopard could not be captured. Kaushal said the leopard was still in the area and four shooters had arrived to kill it. Two more shooters were expected to arrive soon, he added. He said all arrangements to trap or kill the carnivore had been made.